Common lilacs do not usually need watering except when they are first planted, in time of drought, or in late fall before the ground freezes for the winter. At these times, water generously, thoroughly soaking the ground. A soaker hose system or dripping garden hose that waters the soil directly is best so that the mildew-prone lilac foliage remains dry. A layer of mulch on the soil at the base of the shrub will help retain the moisture in the soil longer. Older, well-established shrubs need watering only during severe drought. 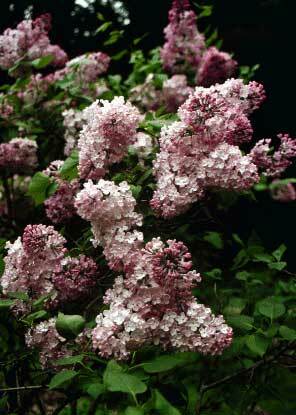 Older lilacs that are in soil rich in organic matter do not need extra feeding. However, young, newly planted shrubs benefit from fertilization for a few years until they are well established. Every other year or so, spread 2 cupfuls of an all-purpose, slow-acting granular fertilizer on the soil around the base of the lilac for the next rain to soak in. Do not overdo, since too much nitrogen will stimulate lots of foliage at the expense of flower production. After several years the decomposing layers of organic mulch at the base of the plant will improve the soil and it should be rich enough to support lilacs with out supplemental feeding. Spread and maintain a 2 or 3-inch layer of organic mulch on the surface of the soil under your lilacs to help keep it moist and discourage weeds. Chopped leaves, bark nuggets or wood chips spread out to the tips of the branches (dripline) will also condition your soil as it decomposes, adding valuable organic matter to it to help it drain well. Keep the mulch about 6 inches from the base of the shrub stems to prevent stem rot and rodent damage. A slightly thicker mulch layer in the winter will insulate the soil so that it is not affected by the typical temperature fluctuations that heave soil and sometimes disturb plant roots. This or a living mulch such as ivy, pachysandra or other groundcover plants also protects lilacs from damage from mechanical yard care equipment. Do not mulch with unchopped leaves because they mat together, preventing water from getting into the soil. Note: If you use lawn herbicides such as 2,4-D products on turf near shallow lilac roots they may develop thickened leaves that curl and die. A ring of mulch around the base of lilac shrubs out as wide or wider than the shrub will protect against this. Delay pruning lilacs for the first 3 or 4 years so that they can develop several strong stems from the base. Then, prune at least every 3 years in the late spring just after they bloom to maintain a regular bloom sequence (lilacs bloom on the previous year's wood). This is also the time to clip off dead flowers to prevent their going to seed. Suckers and weak wood that will not bear flower buds can be removed during the winter. Prune out excess stems, especially older ones thicker than 2 inches with a pruning saw, to increase air circulation and improve light availability for the foliage. Cut out all dead or diseased wood whenever it appears. If a lilac shrub has become so tall that the blooms are above sight lines, cut back the branches (do only a few each year because they will not bear blooms the next season after being cut back) to force the lilac shrub to fill out on lower branches. If you have a grafted lilac, remove all suckers growing from below the graft union to prevent the understock from asserting itself and overwhelming the true branches. Old plants can be rejuvenated by cutting them to within 6 inches of the ground. They'll come back nicely in 2 to 3 years. Stake newly planted lilac shrubs if there is any chance of their being blown over or uprooted before they get established. Place study supports equidistant about two feet outside the lilac’s dripline. Three usually suffice. Loop soft clothesline or cables wrapped with rubberized protection at the point where they touch the lilac bark around the main stem of a young shrub and tie them to the supporting stakes. Do not put any real tension on the lines; the stem should be able to move a little so it will grow strong. Check often to make sure the cables are not binding or injuring the trunk in any way. Remove staking once the roots are securely anchored in about 6 months.